If you are looking for an accent throw pillow cover for your bed or you want to add some color for your living space, Home Brilliant is now offering you a great selection of short plush chenille throw pillow covers with brief textured design. Home Brilliant plush chenille velvet Cushion Cover is made of 100% high quality polyester. Modern, traditional or whatever style your home is, Home Brilliant offers you 7 gorgeous colors to perfectly match your furniture and decor. This chenille cushion cover can match various materials of sofa, such as leather, chenille or linen, etc. SIZE DIMENSION: 2 sizes of cushion covers are available from Home Brilliant. USEAGE: Home Brilliant Chenille Plush Velvet Throw Pillow Cover is super soft and durable. It can mix and match with different materials pillows, like fur, cotton, linen, velvet, leather, etc. 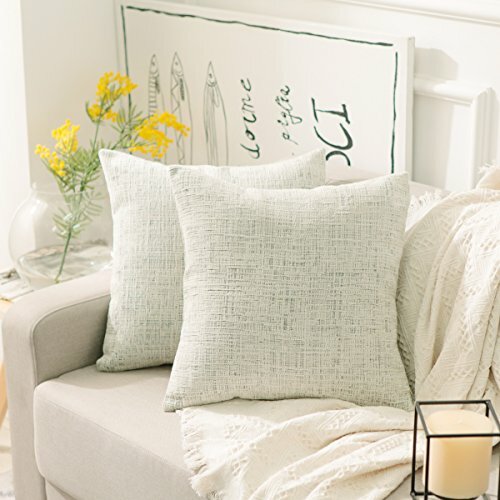 This chenille blend decorative pillowcases have wide applications: you can throw them on sofa, chair, couch, bench, bed, loveseat, or even simply put them on the floor. PACKAGE: each package contains 2 pack of chenille cushion covers, measures 18x18 inch, perfect for 20x20 inch pillow. Noted: PACKAGE DO NOT CONTAINS PILLOW INSERT. EASY CARE: machine wash could separately, gentle cycle only, no bleach, low tempurature iron.